There are 5 Memory Care Facilities in the Fargo area, with 2 in Fargo and 3 nearby. To help you with your search, browse the 1 review below for memory care facilities in Fargo. On average, consumers rate memory care in Fargo 5.0 out of 5 stars. Caring.com has helped thousands of families find high-quality senior care. To speak with one of our Family Advisors about memory care options and costs in Fargo, call (855) 863-8283. 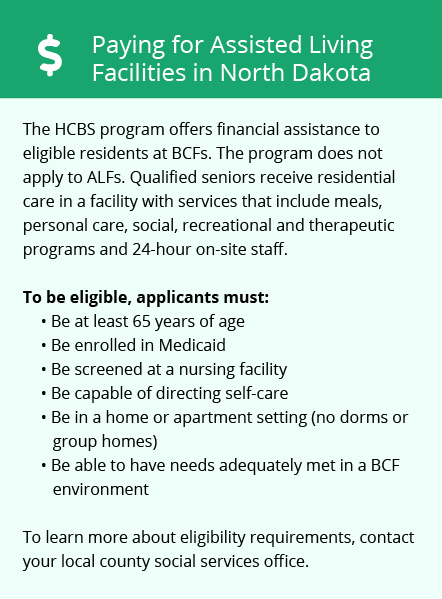 Fargo, North Dakota’s largest city, has numerous facilities for Alzheimer’s and dementia care in the Red River Valley. Almost 11 percent of the city’s total population is over 65. The Alzheimer’s Association projects that 14,000 people in 2018 have Alzheimer’s in North Dakota. There are four facilities in Fargo devoted to helping those with Alzheimer’s disease and dementia and about eight memory care units combined with basic care facilities, as they’re called, in North Dakota. Winters in Fargo can prove challenging for seniors and those with Alzheimer’s. The temperatures are among the coldest in the U.S. and it is common for streets, sidewalks and parking lots to be caked with snow and ice, which increases the chances of slips and falls. Winter is also a long season. Temperatures fall below freezing from October through May in a typical year. The cost of living is on par with the national average. If it were not for the high cost of housing in Fargo, it would rank lower than the rest of the nation. The medical costs are well below the nation at 77, which helps seniors and those with dementia better afford health services. The oil boom in the late 2000s contributed to rising housing values, and in Fargo, those home prices remained stable even after the oil slowdown. High home values help families finance memory care for their loved ones with dementia in the Fargo area. Low income taxes in North Dakota and sales taxes in Fargo contribute to its favorable cost of living for seniors. The state rate ranges from 1.1 percent to 2.9 percent, making it one of the lowest of all the states that levy income taxes. The sales taxes in Fargo total 7.5 percent. Five percent goes to the state, two percent to the city of Fargo and 0.5 percent goes to Cass County. Fargo is home to world-class medical facilities, including those specializing in brain health and dementia care such as Sanford Medical Center, Vibra Hospital and Essentia Health-Fargo, in the event of medical emergencies or illness. Memory Care costs in Fargo start around $0 per month on average, while the nationwide average cost of memory care is $4,798 per month. It’s important to note that memory care rates in Fargo and the surrounding suburbs can vary widely based on factors such as location, the level of care needed, apartment size and the types of amenities offered at each community. To see a list of free memory care resources in Fargo, please visit our Assisted Living in North Dakota page. 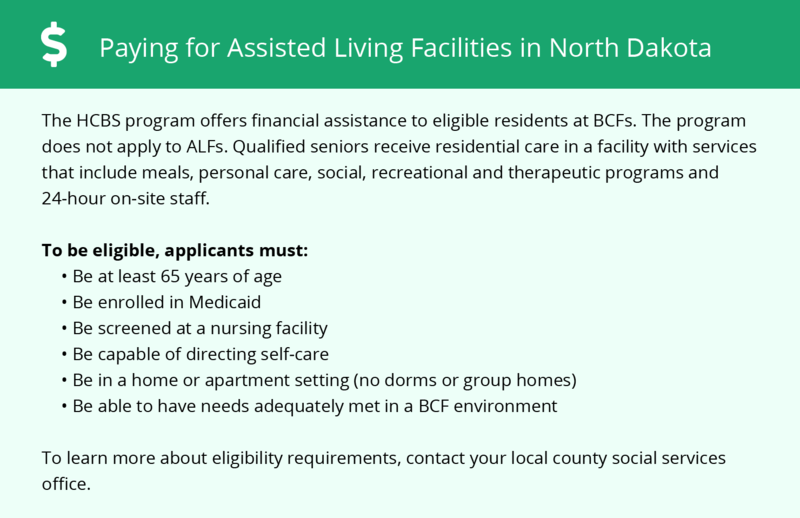 Fargo-area assisted living communities must adhere to the comprehensive set of state laws and regulations that all assisted living communities in North Dakota are required to follow. Visit our Memory Care in North Dakota page for more information about these laws.